Early Years at Weston Green School provides an excellent framework that recognises the importance of play and how it underpins both development and learning for young, curious and inquisitive minds. Through spontaneous and adult-led play, we observe how children’s intellectual, creative, physical, social and emotional development impacts on their learning and we plan further challenges and opportunities for them to extend their knowledge and understanding. Our rich and balanced curriculum introduces each child to a range of concepts, experiences, knowledge and skills for lifelong learning. The curriculum in our Early Years Department is based upon the national guidelines for the Early Years Foundation Stage (EYFS), incorporating the seven main areas of learning, as well as drawing inspiration from the Reggio Emilia Approach to learning. Originating in Northern Italy, the Reggio Emilia Approach promotes independence and creativity through the use of open-ended, natural resources and focuses on putting children at the heart of their own learning. At Weston Green, we achieve this through following topics which are based on the children’s personal interests, as well as involving pupils in collaborative projects and demonstrating through our ‘Working Wall’ displays, that skills and creations can be developed over time. An additional principle of the Reggio Emilia Approach is to ensure a sense of community. At Weston Green, we achieve this through our two-way relationships with parents, the completion of projects alongside local experts and regular celebrations of our pupils’ successes. This unique approach to learning fits seamlessly with the characteristics of effective learning outlined in the EYFS framework, as well as Weston Green’s Learner Profiles, providing our youngest pupils with the wide-ranging skills that will enable them to become effective learners later in their lives, at Weston Green and beyond. 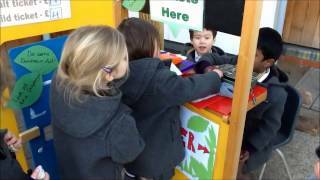 In Kindergarten and Reception, there are many opportunities to take learning outside of the classroom. Our dedicated garden area enables pupils to enjoy their natural environment, have a go at gardening and investigate our Bug Hotel. The children also benefit from regular Forest School sessions, led by our fully qualified Forest School Leader and Kindergarten teacher, Miss Carter, in enchanting local woodland. The Forest School ethos compliments the Reggio Emilia Approach, as it encourages children to use their imagination, solve real-life problems using their own initiative, persevere through trial and error, and cooperate with their friends. These memorable sessions build confidence and self-esteem and always end with sitting together, sharing stories based on pupils’ experiences and enjoying a well earned hot chocolate. Our Early Years curriculum is further enhanced by a number of trips and visits throughout the school year, such as Kindergarten’s popular trip to the Polka Theatre and Reception's trip to pick pumpkins at Garson's Farm. The children's performances to parents at Christmas time, Harvest and at other points throughout the year, also allow them to build their confidence and express their creativity.